Only a couple of days away from the beginning of the Test series between India and England, I realize that I have never before looked forward to a Test series with such desperation as this one. There is more than one reason behind the excitement. Whatever the score-line might read at the end of four test matches, one can rest assured that both teams will have some interesting challenges coming their way. Though this series has been constantly billed as the “revenge” series, I believe that would not affect the teams much, for they have far bigger issues at hand to deal with. As far as the English line-up is concerned, the return of Kevin Pietersen will surely boost the morale of the side but they cannot afford to get carried away. Of late their middle order mainstay Jonathan Trott has not been able to keep up to the high standards he has set for himself over the last couple of years. Injuries to Stuart Broad and Steven Finn have given them more reasons to worry about. Nonetheless, flamboyant KP is always a force to reckon with. If he can successfully put his frailties against slow left arm bowling behind him, the English supporters will be in for a delight. To add to that, they have not yet gotten to taste the kind of spin bowling they are about to face in the upcoming Test matches. I would not bother myself going into the details of the reason behind that (that sure is worth another story in itself). But that does bring me to an over-hyped issue about the fragility of English batsmen against spin bowling. This is not the first time they are touring the sub-continent. Neither is this the best spin attack that India has had in the recent times. So give them a break. They know what they are doing. In case they aren’t, they better do! The Indian outfit, on the other hand, will take on a serious opposition without Dravid and Laxman for the first time in years (no offence meant to the Kiwis). This series shall prove to be the litmus Test for the likes of Gambhir, Sehwag and Zaheer. Gambhir will have to prove that he is not just good for small innings and that he can go on to score some big runs as well. Sehwag will have to make his followers believe that he has not lost his touch while Zaheer’s fitness will be tested once again. Pujara and Kohli showed promise in the series against New Zealand. If they continue their form into this series, England sure would get a run for their money. Yuvraj has given the selectors reason enough to select him for the no. 6 spot. For some reason, he has not been able to do justice to his talent. By now he should have been a permanent member of the Indian test line-up. Ashwin will be the one to watch out for. He has done extremely well in home conditions. He might prove to be the eyesore to most English batsmen. Inclusion of Harbhajan in the squad renders the equation pretty interesting and open to speculations. It would be interesting to see if Dhoni leaves out Harbhajan from the playing eleven to include Ojha. 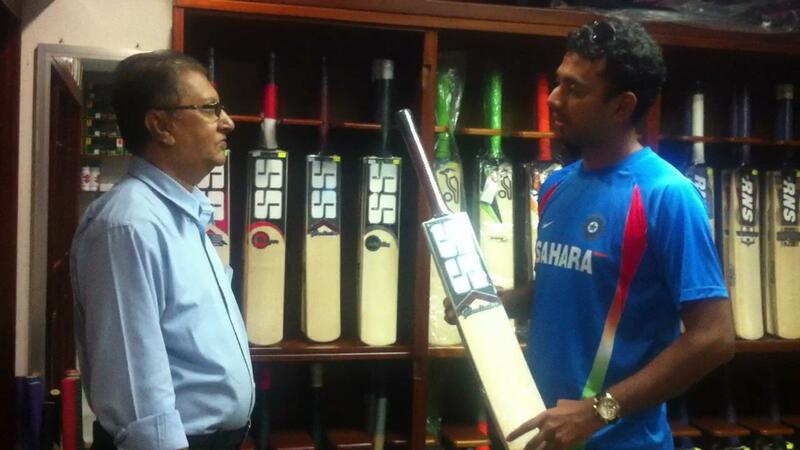 If he doesn’t, it would be a huge injustice to poor Ojha who did very well in the New Zealand series. Dhoni himself has a few questions to answer as far as his batting goes. A batsman of his mettle batting at no. 7 is always a huge advantage to any side provided he is in good touch – or at least in the kind of form he is in the limited overs cricket. Moving on to the last and certainly the most talked about issue of late – would Sachin Tendulkar announce retirement after this series or maybe after the series against Australia? All these speculations have gained some credibility after Sachin himself hinted that he cannot keep playing forever (contrary to what I had been thinking for the last 16 years). He has always been known to hit back hard whenever he has been criticized. Now is one such time. How well does he come back will be a key factor in determining how long he keeps playing from now on. Though there is still some part of me that believes he would keep playing till eternity! It would probably be very easy to get carried away following India’s win in the first Test match against New Zealand in Hyderabad. It sure would take a brave-heart to find shortcomings out of such an emphatic win. But let us not forget the consecutive 0-4 drubbings India has had over their previous two Test outings. At the risk of being called a cynic, I would like to take this opportunity to point out a couple of areas where the Indian team still needs to pay due attention. Before that, let us have a look at the various positives that can be drawn out of this victory. Cheteshwar Pujara justified all that was being said and written about him so far. He, no doubt, is a class act. During entire course of the Test match, he never looked like an enforcer; neither did he look like a mere survivor. He completely looked like one who belongs at that level. He might not be as aesthetically pleasing as Tendulkar or Laxman; but to call him complete (at his own level) won’t be an understatement. Virat Kohli’s half century was like a breeze of fresh air. He must be very disappointed with himself at the way he threw his wicket away for he is one player who always likes to be in the thick of things. Pragyan Ojha bowled like he always does – right on the money. He may not have been successful every time he has been given a chance, but I, for some reason, get the feeling that he is someone who has not always got his captain’s backing. Ashwin yet again showed that he is a lethal weapon on a track that provides some assistance. Though he is just seven Tests old, he has shown a lot of promise. Once again, his real challenge would come when he moves out of his comfort zone and goes to countries like South Africa, Australia or England. He did not fare very well in Australia the last time he went there, but that would have been a bit too much to expect from a spin bowler who had played just three matches before that – all in the subcontinent. There were two aspects of Sehwag that could be seen in this match; one impressed and the other disappointed. First, his slip catching was exceptional. Let us hope that he pulls off similar catches when the pace bowlers are in action. Second was his batting which was not very impressive. Though he did hit a few of his trademark boundaries on the off side during his short stint, he did never resemble the Sehwag of past. Moving on to the pace bowlers; though they did not get much chance to bowl or assistance from the pitch, they failed to impress in whatever opportunities they got. Their Kiwi counterparts did a much better job in comparison. 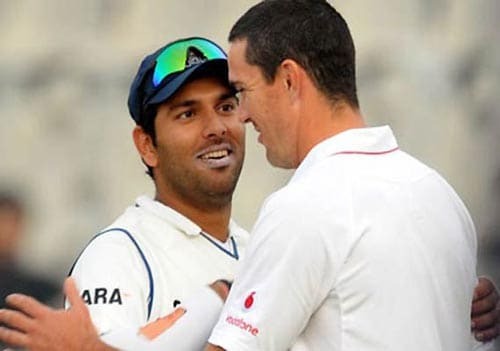 Zaheer Khan, who has been India’s bowling spearhead over the last few years, went wicketless – that is certainly not a good sign. Umesh Yadav did manage a couple of scalps. But his overall bowling was by no means impressive. Suresh Raina failed to hold on to another life given to him. He is doing his chances no good. This season may prove to be his last on the Test arena if his performances continue the same way. He cannot find a place in the Test side just by virtue of his good fielding skills. The overall Indian fielding was a real pleasant surprise though – maybe the injection of young and fresh legs would have done the trick. To sum up, a pessimist might be successful in finding out weak links in however good a Test side. But taking nothing away from the Indian team’s performance, I would like to conclude with this: they not only need to keep up the good work, but also need to focus on a few other key areas if they are to do well in South Africa in 2013 and win back the coveted no. 1 Test ranking. 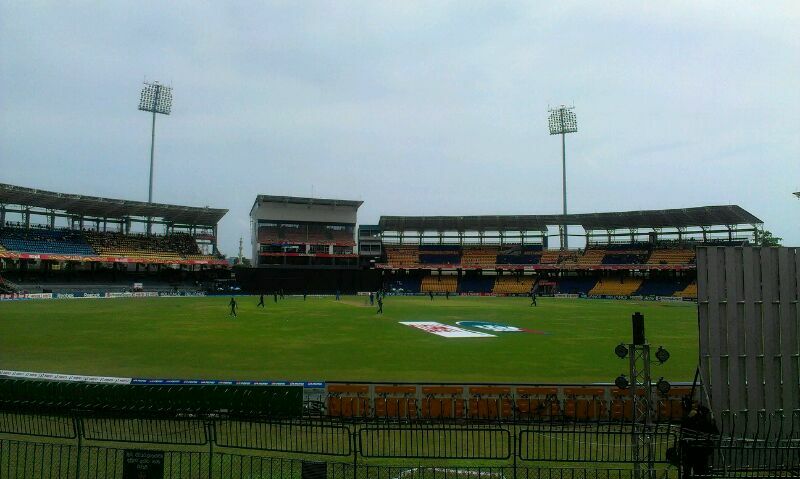 India Vs New Zealand – Hyderabad – 1st Test – Day 1 Review! Ah! A Test match again for the Test match lovers of India. Strangely for the first time without the greats – Dravid and Laxman – the legends that guarded the Indian test middle order batting line up along with Tendulkar for more than one and half decades! It was a wonderful day to start the tour in a beautiful ground. The little grass on the pitch that indicated more the monsson than any assistance to the Kiwi pacers, the all-green quick outfield and well built new-look Hyderabad ground was all a pleasure to watch with Dhoni winning the toss and electing to bat – a perfect wicket to bat on. A lot must have been discussed before the test match to identify the right player to be groomed in filling the no 3 and no 5 positions and also the playing XI also. Looking at the wicket, it was right choice to have had the regular opening pair to open the innings. Sehwag and Gambhir did get off to a good start despite some trouble from the seamers. Both the seamers were initially giving enough trouble to the batsmen although both the openers did punish the odd loose ball with ease. India’s indiscretion in getting out to poor strokes seemed an extension of the one-day series from Sri Lanka than that of early season rust. Gambhir started off with that and followed by his opening partner Sehwag who seemed to be set for another 100 in his own style. 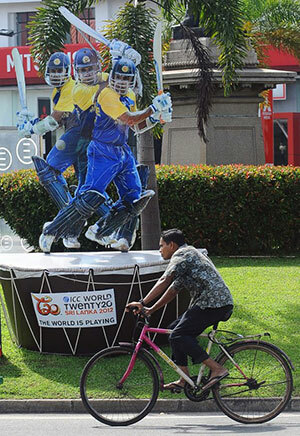 It was glad to see those ‘confident trademark Sehwag boundaries’ before he got out. That must have boosted the confidence in him and also the millions of fans who are desperately looking for a big score from him after sometime in Test Cricket. Like me, most of us would have for sure expected what we saw when Gambhir walked back. The number 3 slot – the Dravid slot! Pujara came in as no surprise choice to bat at number 3. From the very first ball that he faced, it seemed obvious that he was sent and set to make it big today. With Pujara settling down slowly, it was anticipated a big stand between him and the little master Sachin would unfold. However to the disappointment of the nation, Sachin was undone by a beauty of a delivery that nipped back a bit to knock back his middle-stump. Then came Kohli who is fast becoming Mr. Dependable and Mr. Flexible to bat at no.5. Kohli started off with his typical wristy shots. It was pleasure watching Kohli playing those forward drives with so much ease. It was a very well scripted 50 from the young man who could have easily converted and tasted his maiden Test hundred on Indian soil. With Kohli, Pujara carried on to bat unleashing all the shots as he raced from 50 to 100 at run a ball. For what we know him more as a strong on-side player, he showed his class in those back-foot guided punches, square cuts and cover drives on the off-side too. 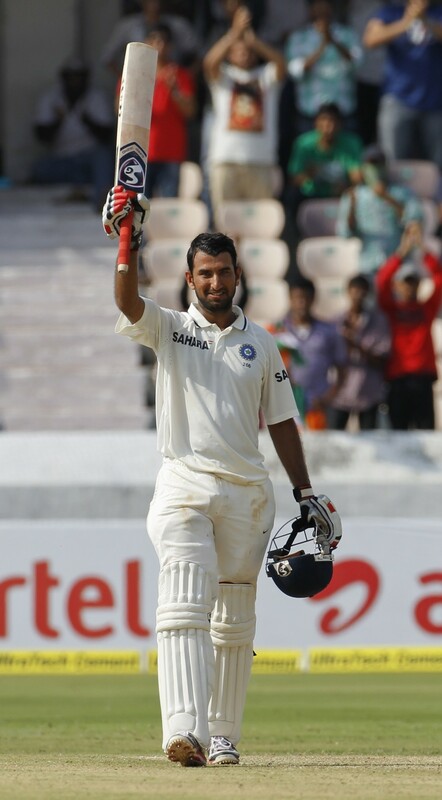 Pujara’s eloquence was as impressive as his temparament as he laced pretty drives and cuts that laced the green turf. With his maiden Test century in the very first match after returning to the international side after more than 18 months, definitely Pujara did justify his recall and played with his head to cement his place in the side – not just in the side but also the batting position for the near future at least. Another debate in the team selection is the choice of Raina ahead of Badrinath / Rahane. Raina continued his poor form once again. It wasn’t the usual Kiwi side on the field with few dropped chances costing them dear. However Pujara was lucky to be still in with umpire denying a caught behind appeal. The Kiwi captain did make his spinner Patel sweat a lot who doesn’t seem to have succeeded enough except taking the wicket of out-of-form Raina. So with Dhoni looking solid in the crease, and with a well set determined Pujara, I am hoping for a 450 plus total on board although half the side is back in the pavilion.